I am a very visual person and I enjoy looking at beautiful things. Then I heard something good about an app many years ago. They said that it’s a platform where you can see and post beautiful photos. I downloaded the app and I’ve been enjoying it ever since. Well, that’s how I got into Instagram. Most of the time, I browse on the app to see travel photos. To make sure that my feed is filled with amazing tourist spots, delicious food, and wonderful people, I followed foreign and Cebu Instagramers. The latter has uploaded travel photos that I’ve been enjoying to see! The Gay Aida Dumaguing of Exotic Philippines shows us the beauty of a first kiss… from a giraffe! Is there anything cuter than love locks? How does it feel like to be at the highest peak of Cebu? Seeing the Taal Lake in the perspective of Adrenaline Romance makes me calm. Reaching the top of Mount Maculot must have been exhilarating! We all need a blanket of cloud to help us fall asleep at night, don’t we? I don’t mind if I become seriously sun-baked on the beach like this! Sunrise just makes my heart flutter! Who has time for yoga and vacation? Apparently, Laagan Nga Bata has! Combining travel and parenting isn’t easy. Victoria must have felt her inner peace when she saw this sunset. Visiting Coron was one of the best things I did this year. This is the postcard view on the way to Kayangan Lake. The climb was a bit exhausting but once you see this view, you can say that your struggle was worth it! Those are just some of the photos I love on Instagram. I hope you enjoyed looking at it. 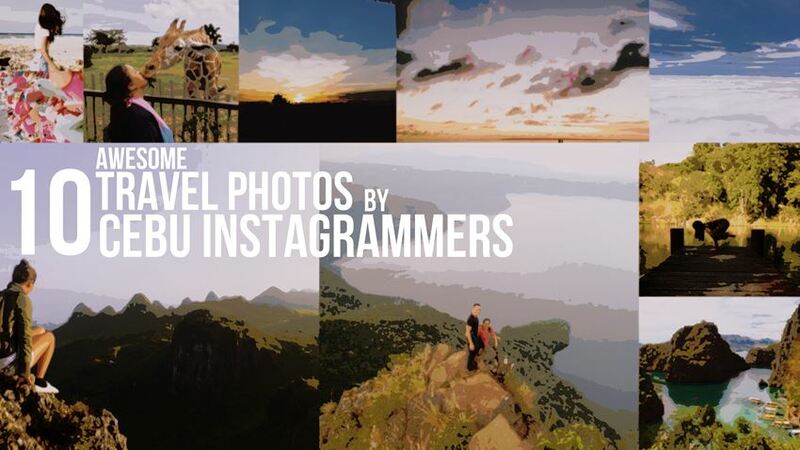 Feel free to browse on the accounts of these Cebu Instagrammers and follow them to get awesome photos on your feed. “Awesome Travel Photos By 10 Cebu Instagramers” is a guest post by Channel Marie Imperial from channelmarie.com as Day 21 entry for The CBC 30 Day Bloggging Challenge. This is a great surprise! Very honored to be included in this list. 🙂 Thank you so much! Basta kamo Gian and Shei! Kurog ko ninyo! Hehehehe!